The Islamic Monthly (TIM) is an independent, nonreligious, U.S. based publication that fosters discussion on a broad range of issues and concerns related to Muslims in the modern world. 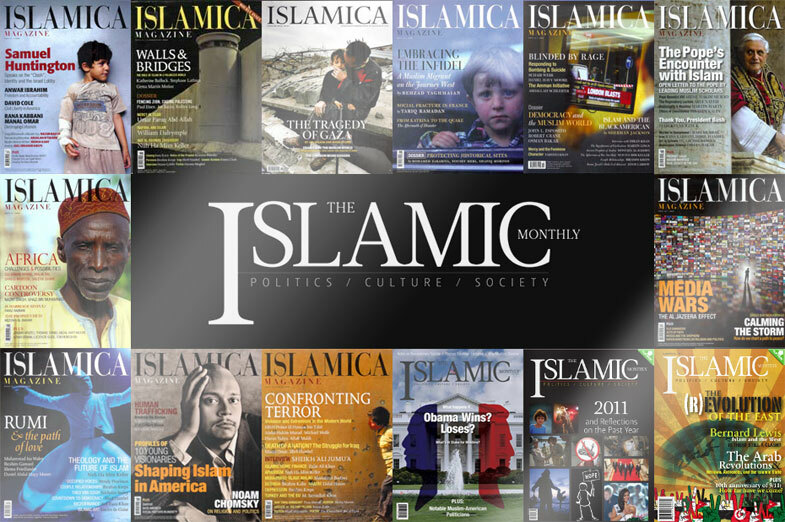 The magazine launched in January 2011, following the legacy of its successful predecessor Islamica Magazine, in an effort to create a forum for the free exchange of ideas, perspectives and opinions. The Islamic Monthly, does not seek to be the sole voice of Islam or the Muslim community. Rather, the magazine is part of an ongoing experiment of a free Muslim press eager to build on the rich tradition of public discourse found in Islamic and Western history. We firmly believe that an honest discourse is only possible when we open ourselves to response, criticism, feedback and debate. In this spirit, we invite our readers, supporters and critics to participate in this process. The magazine is a project of the Global Engagement Group, an independent nonprofit based in Boston, Massachusetts. Q. Why are you called a “monthly” magazine if you don’t publish on a monthly basis? A. Our goals is to be a quarterly print publication with a monthly online edition. While we are not there yet, we are working hard to make that dream possible. Currently, we are a bi-annual print publication and are launching our website, which we plan to soon make a monthly online edition. Q. If you are continuing with the legacy of Islamica, why aren’t you called Islamica? A. This is a very complicated question. First, we are continuing the legacy of Islamica in theory. We wish to build on the big successes that Islamica had, and most of our team either worked for Islamica or wrote for the magazine (and all of us were its fans and avid readers). Islamica, at its height, had tens of thousands of readers globally and its reach was growing daily. The magazine was suddenly shuttered and everything ground to a halt. Among other things, there were disputes over its ownership and therefore the name “Islamica.” To avoid a long, drawn-out and unnecessary legal battle, we decided to change the name entirely. Still, we plan to keep the spirit of the magazine alive and publish its old content using the creative commons license. Q. What do you intend to do differently than Islamica? A. Most critically, we will do whatever we can to maintain our independent media source status–we will never take money from a government nor from any individual or organization looking to advance their own agenda. We will continue to rely on individual donors to whom we send a statement stressing that we accept their donation for our work but that we will always maintain our independent status. Additionally, we intend to maintain transparency of where our funding comes from. We are also working hard to ensure that our print issues are timelyand that the overall structure of the magazine is managed properly. A. Our goal is to utilize the best of modern technology but maintain the long-established tools of journalism. We believe that print is still very vital to journalism and for that reason, we intend to create a hybrid of print and online with various audio and video projects. Q. What is one thing you hope readers will understand? A. No doubt there is a great demand for our work. We are perhaps the first Western-language magazine that cherishes long-form journalism and provides useful insight from Muslim communities on important policies, politics and social issues in America and around the world. But, building this institution takes time and money. We want readers to understand that although we have limited resources (but a very dedicated team of editors and advisory board members!) we are building a solid foundation on which we can grow.